However, when the sun fell, I realized that the room was now too dark… I really prefer the lighter original paint. So now what? Well, we can try another coat – should be pretty easy to cover up my fancy faux finish, already discovered that the dark paint is easily covered by one coat of the light paint. If THAT doesn’t work (as I suspect it won’t), then we will have to, GASP, HIRE someone to do a nice even coat of paint for us. I feel like a total DIY failure at the thought of hiring someone – especially for such a simple task. But my admirable, wise, husband explained that I was looking at it all wrong… I’m hiring someone to TEACH me! After all, with all my experience and research, I’ve been unable to figure out both why the paint is blotching and how to get it right. So we are hiring a professional to teach me how to do it properly. Smart, isn’t he 😉 That’s why I married him! You may remember the guest room in our new house that I was co-opting for my new sewing room? Look at those ugly stripes and the harlequin drapes that don’t match anything! But the room itself is quite lovely. 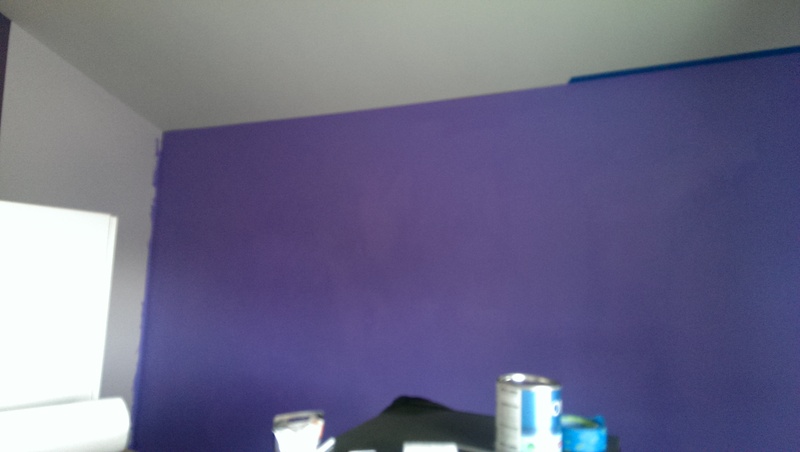 As I mentioned in my last post, I’m trying to paint it a beautiful periwinkle color… I say trying because I’m having a bit of unexpected difficulty with my paint. I’ve painted entire rooms before with Behr paint and no problems – even done faux finishing. But while we followed all the usual advice about prepping the surface and the temperature of the room and climate, the paint is starting to dry the SECOND it touches the wall, which leaves every coat looking VERY uneven and blotchy. This paint was supposed to be one-coat coverage, but on some walls we’ve already finished the second coat, and it is no better… So clearly, painting and repainting is not going to work. I called Behr, but didn’t get much helpful information. Clearly, the solution to blotchy paint is… FAUX FINISH! I had just stocked up on a massive quantity of Behr’s Faux Glaze which Home Depot was clearancing out at dirt cheap, so I decided to do a light glaze overcoat tinted a shade darker than the wall and pounced with cheesecloth. Yeeeaah….. The glaze is supposed to have an open (wet working time) of 8-15 minutes, but it too started to dry THE SECOND it hit the wall, so this was a failed plan. We stopped and when it dried we covered it over with another coat of the periwinkle (Behr’s Carriage Ride – really beautiful shade). I saw this recently on Pinterest and fell in love – maybe this was behind that inspiration? Apparently from a studio called L’Atelier Du Papillon – Butterfly Studio. The house is beautiful, but needs a little work, especially painting the bedrooms! This guest room will become my new sewing room – with separate fabric storage area. I’m so excited, I have so many new projects in mind, I really can’t wait to finish unpacking so I can start!! Meanwhile, the latest spring fabrics have been pouring in – I can’t even keep up with listing them, AND we are going to Chicago next month for the opening reception of an art show I have some work in! 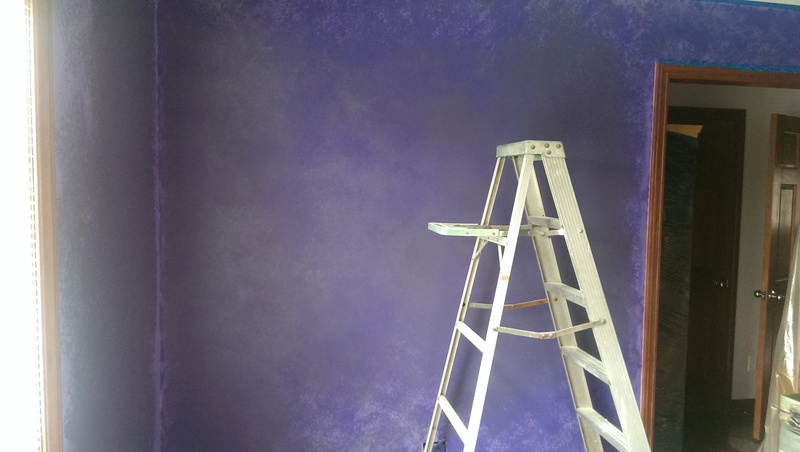 Here is my new sewing room with it’s original paint job, and the new color we are putting in – a lovely shade of periwinkle. 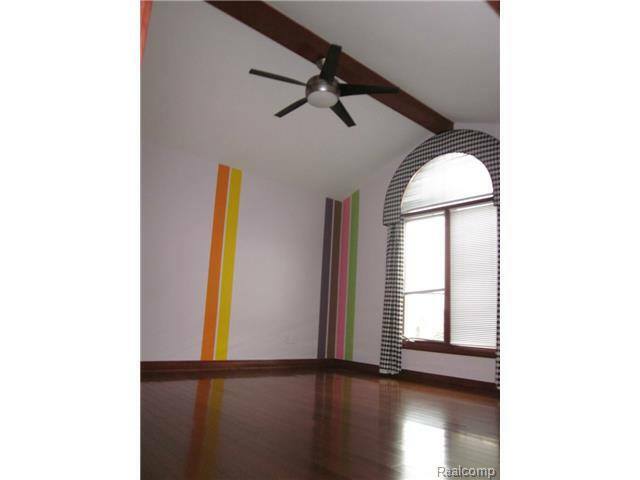 What do you think of the rainbow sherbert stripes? I found them a little bit of an odd choice, even for a child’s room… Is this just me?